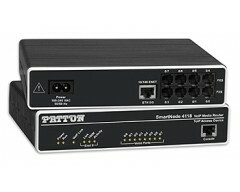 The SmartNode™ 4980VoIP Gateway-Router allows Enterprises to IP-enable their legacy PBX systems. Evolving from Patton’s award winning SmartNode 4960 Series, the next generation SmartNode 4980 Series comes now with IPv6 upgradeable hardware. Like every SmartNode™, the SN4980 supports every industry-standard CODEC to deliver toll-quality voice on every call. The Unified Communications Agent™ (UCA) provides any-to-any multi-path switching (simultaneous SIP, H.323, ISDN, and POTS calls with routing and conversion between TDM/PSTN and IP/Ethernet networks—plus T.38 and SuperG3 FAX). VoIP-over-VPN with voice encryption provides secure voice and data via IPsec with AES/DES strong encryption and automated keying via Internet Key Exchange (IKE). In addition, advanced call-router functionality includes least-cost call routing with flexible dialed-number plan support. The SmartNode survivability suite combines PSTN fallback, SIP Registrar and IP-link redundancy to ensure business continuity in case the IP network fails. Patton’s DownStreamQoS™ delivers the advantage of clear, uninterrupted voice-and-data communication. Furthermore, SmartNode’s unique high-precision clock delivers first-line IP telephony service in demanding ISDN and DECT environments with reliable FAX and modem performance. In addition, SmartNode delivers a smooth transition to VoIP with strong number portability support accepting incoming calls from the PSTN throughout the VoIP service provider's number porting process. Session border router capabilities include optional transcoding for up to 60 channels. Reduce WAN-access bandwidth requirements by converting high-bandwidth G.711 calls on your LAN into lower-bandwidth G.723 calls for WAN transport. Preserve investments in legacy phone equipment while taking the next steps toward unified communications with the SN4980 VoIP Gateway-Router. Providing 1 to 4 T1/E1/PRI and two 10/100/1000 Ethernet for up to 120 VoIP calls, the SN4980 with built-in IP Router delivers secure, prioritized unified communications.